This is where Milkweed Memoir began. 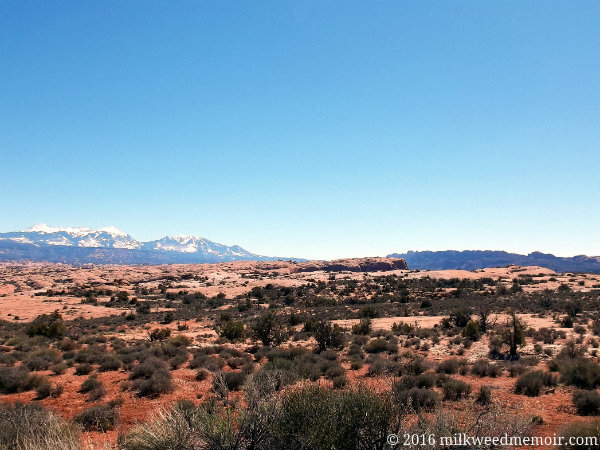 At this spot at Arches National Park in Sept. 2014, Liz and I started planning this journey and this blog. Only she was supposed to join me. She was dying by inches from ALS (Lou Gherig’s Disease). One never knows how the disease will progress, but statistics said she probably had at most two years left. So we decided to go see a bunch of National Parks before she was too weak to travel. In two-and-a-half weeks, we traveled from Brownsville, Texas – nearly the southernmost point in the continental United States – to Glacier National Park on the Canadian border – and back again. We saw 17 National Parks, as well as other beautiful sites. But the trip was so quick! Too quick. The day we visited Arches, we drove from Farmington, N.M., to Salt Lake City, Utah. We stopped at Mesa Verde National Park as well. We only got to spend about an hour at Arches, enough to do the scenic drive and zip along to Salt Lake. Passing La Sal Mountain Viewpoint, we began lamenting how quick the trip was. We started talking about how great it would be if, after Liz retired, we could spend about a week at or near each of the parks. As many as possible, anyway. Really take time to absorb the places, to grok them. And being a marketing writer, I started pushing the idea of a blog about our travels, maybe a book deal. I started spinning the idea of endorsements from the wheelchair van and DME manufacturers. I sold it as a chance to do well by doing good and inspiring others. But Liz put her foot down against any media interviews or other personal exposure, which would be necessary for such a scheme. She was a shy, private person. Still, the idea of traveling more and more slowly – even in a wheelchair van, even lugging along a trailer of medical equipment – had captured our imagination. It was the seed of a plan. Her disease progressed faster than we feared, however. She died exactly one year ago, March 19, 2015. In the months before she died, I promised her I’d do this trip for her and take her ashes, mixed in milkweed seed balls, to every National Park in the Lower 48. Now I’m here at the beginning place exactly a year after she died. I said a few words, toasted her with ice cream, and let loose a seed ball. This trip and blog are a lovely memorial, I guess. That’s what people tell me. But I’d much rather have her here with me, seeing what I see. Death isn’t fair. We humans may never escape death, but I believe that with hard work and funding, we will conquer ALS. Please donate to The ALS Association. They are doing an amazing job of supporting both current ALS patients and primary scientific research into the disease. 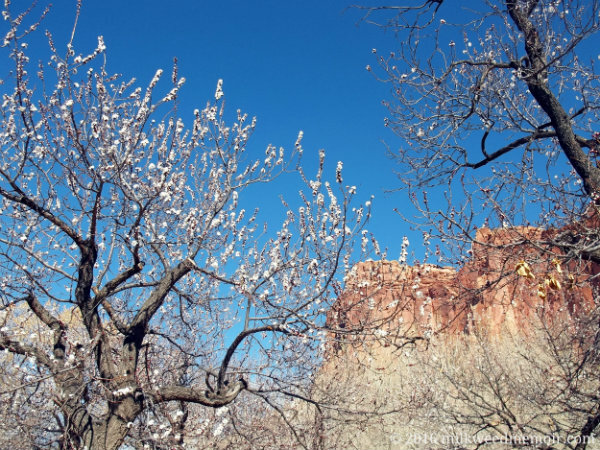 In mid-March, apple trees blossom in the historic Fruita, Utah, orchards, against the background of Capitol Reef National Park. Visit during harvest season, and you can sample the apples, cherries, peaches, and other fruit – as much as you can eat! But you're not allowed to take any extra from the park. I left a milkweed seed ball in this fertile place along the headwaters of the Fremont River. 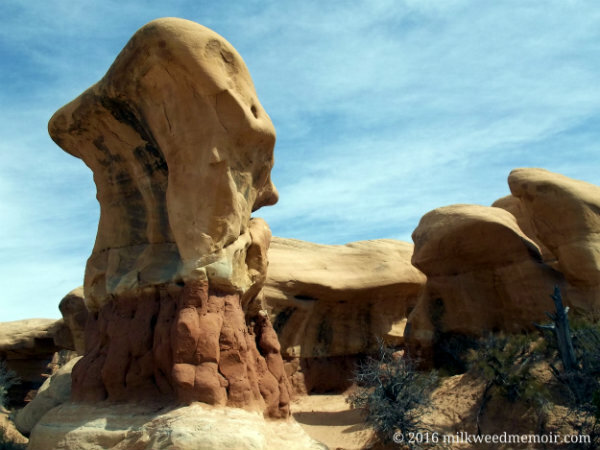 Along the 40 mile gravel road from Escalante, Utah, to the famous Hole in the Rock is Devil’s Garden, a hoodoo labyrinth that could be an original Star Trek set. With each narrow corner I turned, horn-heavy danger music from the original series blasted through my head. And I kept expecting a love-sick Vulcan to jump out at me, exotic polearm in hand. It’s a lovely spot for a picnic! Wonder if Gene Roddenberry ever stopped by to munch on some chicken salad?